If you are looking for information on the Genghis Grill franchise business opportunity, Genghis Grill franchises or Genghis Grill franchising, then you have come to the right place. The Genghis Grill system is successful because of its unique energy and its commitment to some of the highest operating standards in the industry. If you are prepared to dedicate yourself to the same, we encourage you to investigate our franchise offering. The advantages to owning a Genghis Grill franchise are as numerous as the khanbinations available in our restaurants. Genghis Grill provides assistance through every phase of the development process, from site selection and design to training and hosting your Grand Opening. Since the inception of this fun and interactive concept, Genghis Grill has carefully built an experienced team of franchise and restaurant professionals to assist you. Our staff brings a wealth of experience from a broad cross section of the franchised food service industry and we can help you find solutions to any challenges you may face. Our concept, corporate culture and operational systems have been thoughtfully developed to provide you with the necessary ingredients to successfully Build Your Own Franchise! What is Mongolian Stir Fry? It's actually not a cuisine, but an interactive style of exhibition cooking modeled after a centuries-old legend. According to this legend, 12th century Mongol armies, led by the mighty warrior Genghis Khan, heated their shields over open fires to grill food in the fields of battle. At Genghis Grill, diners' build their own bowls' from a selection of fresh meats, oils, vegetables, sauces, and spices in Khan's Kitchen (a food bar featuring an array of over 80 ingredients). The diner then hands the creation over to one of our Grill Masters, who cooks it on a large, round grill in a matter of moments. Call it build your own stir-fry fun, unlimited variety, interactive, and delicious! 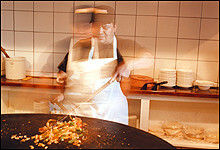 When it comes to Mongolian Stir Fry, we are the experts. Our start-up support includes site review, construction assistance and access to architectural and design consultation. We offer personalized and comprehensive classroom and on-the-job training, on-site grand opening training and assistance, continuing marketing guidance, our exclusive supplier and purchasing programs and ongoing restaurant-level supervision, feedback and support. As the old industry adage says, "There are three important keys to success - location, location, location!" 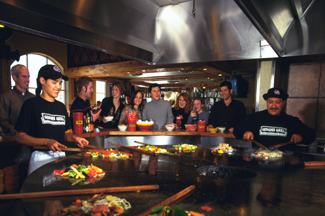 Through our collective experience, the staff at Genghis Grill has located hundreds of successful restaurant sites. Combine that with the specific knowledge of what site and market characteristics make a great Genghis Grill, and you have a formula for success. We are committed to the success of our franchise owners and will make our expertise available to you as you search for your own location. Although the final decision is yours, we will be there to assist you at every step of the process.